The writings of St. Jerome (c.340-420) are numerous and voluminous, and include works on the Bible, theological controversies, histories, translations (notably a new translation of the Bible into Latin), and letters. This manuscript contains a collection of the 120-odd surviving letters (some of them written to Jerome, rather than by him), many of them originally composed with a view to publication. The final page has a medieval ownership inscription of Chertsey Abbey, in Surrey. 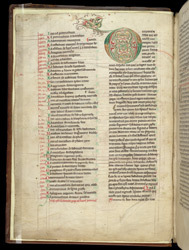 In the left-hand column is the end of a numbered list of the letters in the manuscript, and the text of the first letter (from Pope Damasus to Jerome) starts at the top of the right-hand column with a fine foliate initial 'D'.